BOSTON – Those local theater troupes hoping to find themselves on award platforms for work done in 2018 are forewarned: The bar has already been set high. 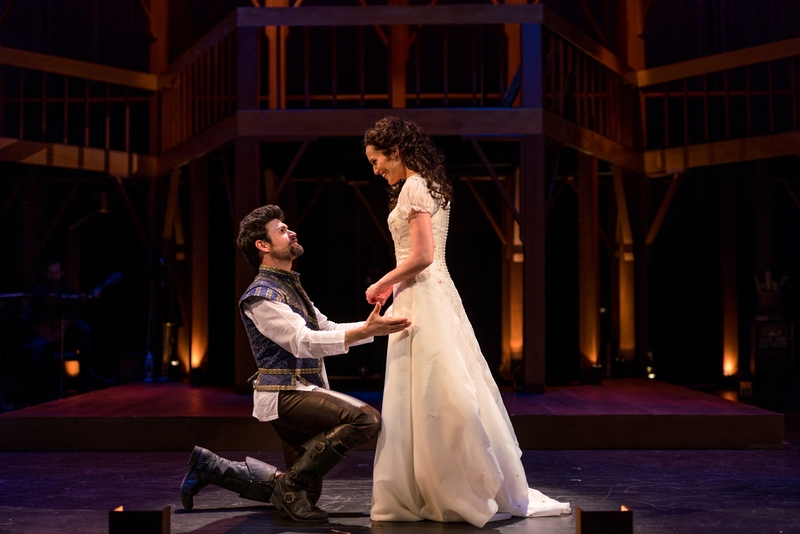 The Speakeasy Stage Company’s “Shakespeare in Love” is a beautifully conceived and realized production, from the direction to the production values to the acting, a theatrical spectacle that delivers both as an entertainment and also as an emotionally satisfying experience. The stage adaptation by Lee Hall based on the Oscar-winning screenplay by Tom Stoppard and Marc Norman is set in 1593 in London and follows the evolution of Shakespeare as an artist, and how those who loved him and cared for him help elevate him from a promising young writer to a cultural icon for the ages. And while the central characters in the stage version remain young Will (George Olesky) and Viola de Lesseps (Jennifer Ellis), this adaptation shares the wealth, and is more rounded than the film in how it gives each member of the cast of 18 his or her own time in the spotlight. As the piece opens Will is suffering from a severe case of writer’s block, a problem since he has promised to deliver finished manuscripts to the hands of Henslowe, the owner of the Rose Theatre, played by Ken Baltin, and Richard Burbage (Omar Robinson), the finest actor in London. And when he agrees to stage the show at The Rose, it is supposed to be a comedy complete with pirates and a dog, the sort of show favored by Queen Elizabeth I (Nancy E. Carroll). Hilarious auditions for the unwritten show ensue, with a particularly effective turn by a young “man” named Thomas Kent. Olesky and Ellis ground the production with their talents, and bring the requisite romance to the fore from their first encounter, and later as Viola goes under cover of male clothing to become the male actor Kent, a forbidden act at a time when all actors were male and actors in general were held in low regard. “Shakespeare” is going nowhere without a long string of fine supporting performances. As Christopher “Kit” Marlowe, who in recent years was credited with being co-author of three of Shakespeare’s Henry VI plays, and was probably a major contributor to several others, Eddie Shields gives a well-rounded, affecting portrait of the talented, ribald, hard-partying BFF of Will whose influence on the playwright is undeniable. He is hilarious as he provides the soundtrack for the flummoxed Will’s wooing of Viola. The gifted comic actors Baltin as Henslowe, the owner of the Rose Theatre, and Remo Airaldi as Fennyman, who muscles in on Henneberry’s newest production to satisfy a debt, perform roles that are right in the actors’ wheelhouses. Jesse Hinson thrives as Ned Alleyn, an acclaimed actor with a habit of swallowing playwrights and productions whole. Damon Singletary is Edmund Tilney, the queen’s imperious Lord Chamberlain, and Robinson has a fine turn as Burbage, London’s’ most acclaimed actor, pursuing Shakespeare around London and finally dueling him on the stage of the Rose. Lewis D. Wheeler is the handsome but caddish and abusive Lord Wessex, the royally bred but broke fiancee of Viola. 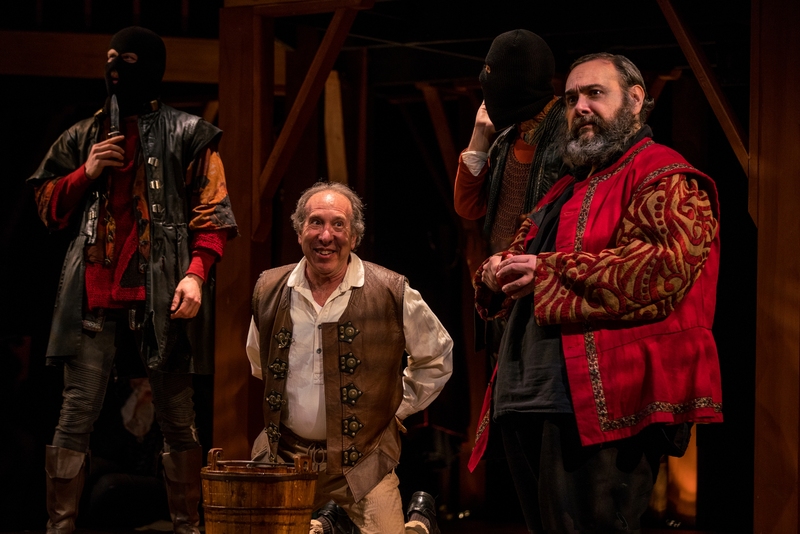 Steve Auger has some nice moments as a burly Nurse in “Romeo and Juliet,” as does Paul Alperin as Wabash, a stuttering mess of an actor who manages to bring it all together at a crucial point. The question becomes whether Shakespeare can overcome all the forces arrayed against him and drag “Romeo and Juliet” across the finish line. Award-winning Director Scott Edmiston is the type of artist you want in charge when you have committed the resources Speakeasy has committed to this production, and he faithfully marries the skills of the cast and brisk pacing to working in concert with his design team, who are all at the top of their game. The devil is in the details of a period piece, and it all starts with Jenna McFarland Lord’s rendition of the Rose Theatre in London, a two-level masterpiece often festooned with the pages of a manuscript. David Reiffel’s original music and sound design and sumptuous period costumes by Rachel Padula-Shufelt also greatly contribute to the feel of authenticity in replicating a time and place. It’s no mystery here. The blood, sweat and tears are right up there for everyone to see. 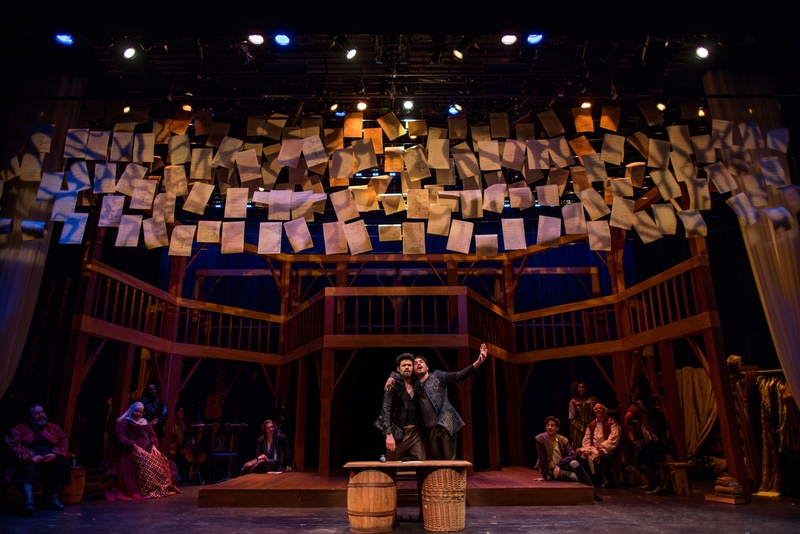 The Speakeasy Stage Company production of “Shakespeare in Love.” Adaptation by Lee Hall, based on the screenplay by Tom Stoppard and Marc Norman. Directed by Scott Edmiston. Scenic design by Jenna McFarland Lord. Original music, sound design and musical direction by David Reiffel. Choreography and period movement by Judith Chaffee. Costume design by Rachel Padula-Shufelt. Lighting design by Karen Perlow. Props design by Abby Shenker. Fight direction by Ted Hewlett. At the Calderwood Pavilion of the Boston Center for the Arts through Feb. 10. speakeasystage.com.